Be in the heart of it all in this nice one bedroom! This one bedroom condo is a great option for the value minded family or small group. Efficient with space, this cozy condo accommodates four on one queen bed and one sofa bed. An extra twin futon provides extra space for a small child. A fully equipped kitchen adds to the convenience, whether you’re coming off the hill for lunch or setting up for a quiet family dinner. This condo may be basic but it has all you'd need! 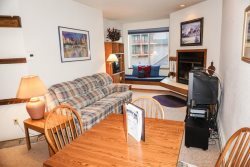 All original fixtures in this Sun Meadows one bedroom but it is clean and well kept. This home is perfect for a family with mom and dad in the bedroom and the kids in the living room. It's small but cozy. The kitchen is fully stocked and the best part is THE LOCATION! It's basically ski-in ski-out being right across the street from the lifts and all. You won't need your car the entire time! Have two cars? That's fine too! Drop one off at an overnight parking lot and shuttle back to base camp! We provide the following amenities: dining table seating for 4, dishwasher, electric stove, microwave, coffee maker, basic pots and pans, dishes and silverware. TV with DVD player and VCR - Video Library Provided - Cable. There are a few items that needs to be addressed with this unit. The small window by the sitting area doesn't close well and therefore snow accumulates onto the sill. The kitchen faucet has a small leak. However, we greatly appreciated the huge pile of wood that was supplied. We've stayed in other units in Sun Meadows where no wood was supplied and had to find some. MANAGER RESPONSE: We have let our maintenance staff know to fix these items. The property was as described, even better, we had more space than we expected which was great. The man fixing the TV was charming and let us in a few minutes early, which was nice since my son had hurt himself. A very convenient location even within the overall convenience of Kirkwood. Please just replace the Belton cable so we don't have to rewrite the TV to get the blue ray working. Thanks! MANAGER RESPONSE: We will replace the cable.